These procedures explain the requirements for transporting biological material considered to be biological hazards. This document is for use by University researchers who need to transport biological samples. The procedures explain the requirements for transporting biological material considered to be biological hazards and include transport requirements for infectious, diagnostic, exempt, genetically modified and quarantine material being transported by air or surface. These procedures assist researchers in ensuring that they are compliant with the requirements and safe working procedures when transporting biological material. The information is a guide on how to categorise items to be transported, how to pack these items, and what documentation and permissions are required prior to transport. The transport of biological material is regulated by a variety of legislation because many types of biological materials are considered dangerous goods. The legislation to be followed depends on whether transport will be by air, post, road or rail, and whether the biological materials are infectious, genetically modified or quarantine. The intent of all the transport regulations is that packaged material should not escape from the package under normal conditions of transport. The transport of live animals is not regulated under transport of biological material guidelines. However, any infectious tissues from animals fall under the transport regulations. Note: toxins from plant, animal or bacterial sources should be considered under Class 6.1 Toxic substances – refer to the Dangerous Goods Regulations for further detail, or contact your approved CASA/IATA packager. Examples of Class 6.2 infectious substances include biological products, cultures, patient specimens and medical or clinical wastes. 1. Category A – an infectious substance which is transported in a form that, when exposure to it occurs, is capable of causing permanent disability, life threatening or fatal disease to humans or animals. The list is not exhaustive. Infectious substances, including those containing new or emerging pathogens must NOT be transported as diagnostic specimens e.g. a Hepatitis B virus culture falls under Category A Infectious substance, the UN Number is UN 2814. 2. Category B – infectious material that does not meet the criteria for inclusion in Category A and is known or suspected of containing less virulent pathogens. Such material is assigned to UN3373, except for cultures of material which must be assigned to UN 2900 or UN 2814 e.g. a blood sample containing HIV that is being sent for HIV testing should be sent as UN 3373. The shipping name is “Biological substance, Category B”. As a pure culture, HIV would be in Category A. If a sample of blood contains Streptococcus A, it would be a Category B UN 3373, whereas a pure culture of Streptococcus A would be Category B UN 2814. 3. Exempt Category – minimal likelihood that pathogens are present e.g. a urine sample being sent for testing (i.e. diagnostic samples). Specimens containing Risk Group 1 pathogens are not subject to the Regulations. The Exempt Category is not considered a Dangerous Good, however these specimens still need to meet certain packaging and marking requirements detailed below in Section 6.2. Australian only category: Category C material is defined in the Australian Standard AS4834 Packaging for surface transport of biological material that may cause disease in humans, animals and plants. It applies only to surface transport within Australia i.e. by road and rail. If this material is transported by air, then the IATA regulations for Exempt patient specimens shall be followed. The international regulations for the transport of infectious substances, diagnostic specimens and GMO's by any mode of transport are based on the recommendations of the United Nations (UN) Committee of Experts on the Transport of Dangerous Goods (available via UNECE.org). The International Civil Aviation Organisation (ICAO) and the International Air Transport Association (IATA) have also incorporated the UN recommendations in their respective regulations. The World Health Organisation (WHO) serves in an advisory capacity to these bodies. Carbon dioxide (dry ice) UN 1845. Packaging and labelling for Class 6.2 infectious substances must meet CASA/IATA requirements. Requirements for exempt, genetically modified and quarantine material are covered in sections 7-9 below. In general, infectious material requires triple packaging and the packaging must be IATA approved (they will be stamped with an approval). These packages have been drop tested and pressure tested and are available commercially. You are not allowed to pack Category A and B biological material for transport by air unless you have done a Civil Aviation Safety Authority (CASA) approved training course. This certification must be renewed every 2 years. Contact your local safety coordinator for information on who has done the CASA approved course for packaging biological material. Some packages may require specific dangerous goods markings e.g. the Class 6.2 infectious and Class 9 miscellaneous (for dry ice and/or GMOs). In addition they must also have the appropriate UN numbering on the package, the appropriate shipping name and include an itemised list of contents and a shipper’s declaration. In order to send Category A or B material by air, you must contact your local safety coordinator to arrange for your local CASA/IATA approved packager to package, label and prepare the transport documentation. The alternative is to pay commercial companies (such as World Courier, Marair or Fedex) to pack and deliver your material. Commercial companies usually send their packages on cargo planes. Note: You can carry certain packages on commercial flights, but the airline must be notified in advance. Ultimately it is the pilot’s decision whether the package will be allowed on the plane, and they have the right to refuse at time of check-in. Infectious substances are PROHIBITED by Australia Post in international mail. Infectious substances may be sent domestically (i.e. within Australia only) from the University using Australia Post under very strict conditions as set out in Section D10.3 – Infectious Substances, Dangerous & Prohibited Goods & Packaging Post Guide (2009). Additional charges will apply. Please note that there has been a lot of difficulty experienced with trying to send Category B material with Australia Post in the past, and despite the detailed instructions issued by them, there is no guarantee they will accept your material. It is therefore advised that a recognised courier be engaged to transport any infectious material within Australia. The shipper must ensure that the goods are prepared in such a manner that they arrive at their destination in good condition and that they present no hazard to people or animals during shipment. *Contact your local safety coordinator for information on who has done the CASA approved course for packaging biological material that is to be transported. The Australian Code for the Transport of Dangerous Goods by Road and Rail 7th Edition (ADG7) requires Category A and B biological material to be packed and labelled as per the IATA air transport requirements. If you intend to use your car to transport Category A or B biologicals for purposes of work, you should first check with your car insurance company to see if your car insurance is valid for this purpose. We discourage the use of personal vehicles for this type of transport and recommended that you use a University vehicle as the University has an exemption notice from Queensland Transport provided UQ personnel follow the requirements set out in ADG7. Although the Exempt Category is not considered a dangerous good, the regulations say that an element of professional judgment is required to determine if a substance is Exempt. Exempt Human Specimens and Exempt Animal Specimens do not meet the criteria for Category A or B infectious material. The UQ IBC however, expects persons wanting to transport Exempt category material, to use the services of a UQ approved CASA/IATA packager. Names of people with current packaging certificates can be obtained from your local safety coordinator. You do NOT have to put the mark UN 3373 (diagnostic specimens) on the package. Although a Shippers Declaration is NOT required, a consignment note/airway bill is required. Exempt category material can be posted so long as it is acceptable in the destination country. If you send your biological material by post it may be transported by road, air or sea (multimodal transport). If your material is going overseas, other countries will have different requirements to those in Australia. In fact some countries will not accept any biological material through the post. It is your responsibility to determine what these requirements are - see the International Post Guide. Even when using Australia Post to send mail and packages, most will still be transported by air during a portion of the journey. As such, the packaging will have to meet the IATA requirements. In addition to this, Australia Post has its own marking requirement. Documentation and any coolants should go between the secondary and outer packaging. Documentation must be accessible to the transporter without opening the inner package. The package must be secured to the vehicle so that it will remain in position under adverse conditions e.g. accidents and or during heavy braking conditions. It should be segregated from other material and be good quality and strong enough to withstand normal transport conditions (consider vibration, heavy braking). The above requirements for road and rail transport of Exempt Category material are also reflected in AS 4834:2007 Packaging for surface transport of biological material that may cause disease in humans, animals and plants. Appendix E of this Australian Standard has a sample declaration form that can be used for Exempt Category material. A leak-proof primary receptacle must be used e.g. capped tube. If there are multiple primary receptacles, they should be secured together (e.g. by a rubber band) to prevent damage or be individually wrapped or separated to prevent contact. A leak-proof secondary package must be used e.g. plastic box or screw-capped jar. Hard outer packaging must be used e.g. esky (must NOT be polystyrene). Absorbent material in sufficient quantity to absorb the total volume of liquid specimens should be placed between the primary and secondary receptacles. If using Australia Post, you must obtain from them the specified markings and shippers declaration. Specimens from human or animals with non-infectious diseases for testing of biochemical or antibody levels (minimal likelihood that pathogens are present). 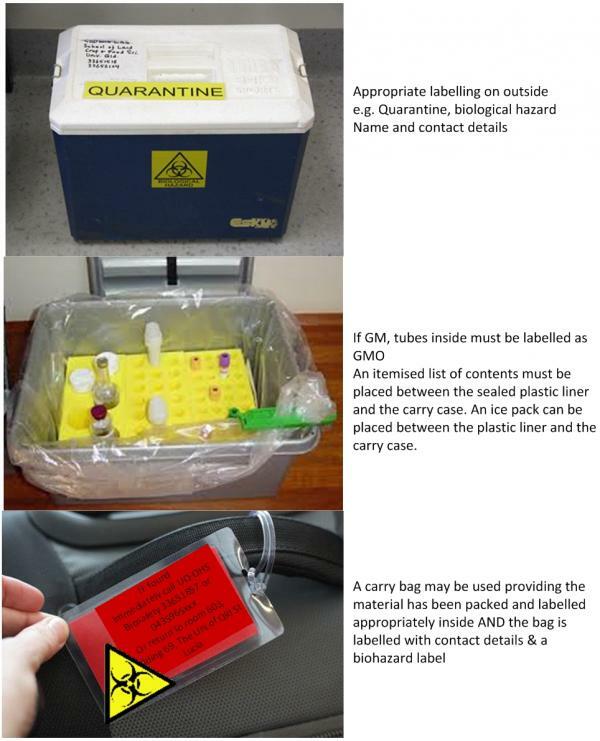 GMOs transported internationally must be packed and labelled according to IATA Packing Instruction 950, or for infectious GM packing instruction 602. Refer to your local certified CASA/IATA packager. If you use genetically modified material for your work then you should refer to the OGTR Guidelines for the Transport Storage and Disposal (TSD) of GMOs. Transport of GMOs includes transport out of a PC (Physical Containment) certified facility for GMO and includes waste generated by this work. Mandatory training is required by OGTR for people transporting GMOs and waste out of certified facilities. These requirements are covered in detail by the OGTR TSD Guidelines as well as in the online OHS-Biosafety training available via UQ elearning. For the purposes of GM Transport, an authorised person is a person who has received the appropriate training and experience to deal with GMOs. GMOs in a PC certified facility must not be removed unless they are being transported to another PC certified facility suitable to contain that GM material (i.e. PC1 GM may be moved to a PC1 or PC2 lab, PC2 GM cannot be moved to a PC1 lab), or to a storage area approved as part of an NLRD or DNIR, or removed as waste for decontamination. Packaging varies depending on the type of transport used as well as what type of genetically modified material is being packaged. Transport of GMOs, including the transport of waste within a building, must be contained within a sealed unbreakable primary container, and the primary container must be packed inside a sealed unbreakable secondary container. If coolants are used, they are to be placed outside of the primary container. See Section 12 for detailed information on using coolants. Note: secondary containment is not required for small animals containing GM microorganisms (e.g. mice) when they are being transported in a sealed cage fitted with HEPA-filtered vents. The material must be clearly labelled so that any person transporting or handling the material during transport is aware that it is a GMO (this includes mice). The outermost container must clearly show the details of the sender (name, address and 24 hour contact number) so that the sender may be contacted if the package is lost, damaged or misdirected. Every effort must be made to locate and retrieve the GMOs and return them to the container, or render them non-viable (e.g. using a chemical disinfectant). Notify the incident to the Biosafety Advisor as soon as possible. Consider whether the package should contain instructions on how to decontaminate material in case of a spill or leak, decontamination agent, and PPE. If appropriate sturdy packaging has been used, and the GMOs packaged properly, this may not be required. Also consider any further hazards that may be introduced by carrying a decontamination agent. Procedures must be in place to ensure that all GMOs (or for micro-organisms and cell cultures, the number of primary containers of cultures of GMOs transported) can be accounted for and that a loss of GMOs during transport, or the failure of delivery, can be detected. An example would be for both the sender and recipient to keep records of the transport and verify the records for consistency. This is not required where transport takes place entirely within a building providing it is conducted by an authorised person. Access to the GMO/GMMOs must be restricted to the authorised person. For example, where bins are left for collection in a loading area, the loading area must have restricted access, or the containers must be kept locked. The outermost container must be free of contamination prior to transport, and the outer surface of the primary containers must be free of contamination prior to transport. Unless kept in a certified facility, decontamination of all containers (including wheelie bins, trolleys and eskies) is required after transport. If the GMO is a Risk Group 2 microorganism, a biohazard label is also required on the outermost packaging and should be treated as per Category A or Category B material as outlined in Section 6. These materials should only be transported between campuses using an approved courier (or approved waste contractor in the case of GM waste transport), or by an authorised person using a University vehicle. This is not required where transport takes place entirely within a building, providing it is conducted by an authorised person. If the GMO is a Risk Group 3 or 4 microorganism, a licence will be required by the Gene Technology Regulator (i.e. a DNIR). Transport and labelling must be done in accordance with the conditions set in that license. If your biological material is subject to Department of Agriculture-Biosecurity (DAgB) Permit, please read the conditions of that permit (including labelling and accompanying documentation) and comply with any transport requirements as directed by DAgB. All quarantine material must be double contained and in a hard spill-proof outer container as a minimal requirement. If your material requires the use of a Quarantine Approved Premise (QAP), regardless of the level of containment, the permit should list the QAP numbers and the method and route taken must be documented in the QAP SOP. Movement between QAP’s must be recorded (traceability record sheets are in all QAP yellow folders for this purpose). If the QAP is not listed on the permit then DAgB also require a Transfer Permit to be approved prior to any movement of QAP material. Refer to the following links: transfer of quarantine material; and transfer of live quarantine animals. Quarantine material must be transported by Quarantine Accredited Persons i.e. persons who have completed the mandatory quarantine training courses hosted online by Guardian and who hold current certificates, otherwise an approved courier service may be used. You must ensure the courier company is aware that the consignment is under quarantine. A spill outside of a QAP must be reported to the Biosafety Advisor as soon as possible, along with any actions you have taken to recover and decontaminate the material. The Biosafety Advisor will notify the Regulator as required. Low risk biological material may be transported by person by any means within and between UQ Campuses and sites providing the material does not meet the definition of infectious material, and it is accompanied by an authorised person who is familiar with the contents of the package and is confident in procedures to clean up any spills. If you wish to use the UQ Chemical Store, packaging should meet the requirements outlined below. You must state on the outer package (e.g. hard esky) if there is a fixative such as formaldehyde or any other dangerous goods (e.g. ethanol, dry ice) present in the package. To arrange pick up and delivery please contact the Chemical Store on uqchemorders@uq.edu.au. GM material may be transported by person, providing the GMO falls into the GMO exempt or PC1 NLRD or PC2 NLRD category, and is NOT a risk group 2, 3 or 4 infectious microorganism* (as defined in AS/NZ 2243.3). Some examples include plasmids containing DNA from another organism, purified DNA and GM seeds. The GMO must have primary and secondary containment (e.g. microfuge tubes within a sturdy ziplock bag). The primary container must be clearly labelled as containing GMOs. Ice blocks or gel packs may be used as a coolant, provided they are placed outside the secondary containment e.g. outside of the ziplock bag but within a hard esky. The outermost container (e.g. hard esky or carry bag) must be clearly labelled with the sender contact details (e.g. a luggage tag may be used) including 24 hour contact in case the bag is lost or stolen. The label must also have a biohazard marking. The container must be accompanied at all times by an authorised person. A list of the items being transported should be kept with the transport container and should be accessible without opening the inner package (e.g. may be placed in an envelope in the carry bag, or may be placed in a clear invoice type envelope attached to the esky). Record of transport including all items, must be kept and verified by the sender and recipient laboratories. The recipient laboratory must be certified to an appropriate level (e.g. PC1 or PC2). The Biosafety Advisor must be notified of any adverse events that occurred during transport. Requirements as stipulated in Section 8 must be followed (i.e. packing, accounting, labelling, spills and notification). Providing the material is not considered Category A or B or Risk Group 2, 3 or 4 infectious material, it may be transported as per ‘exempt’ biological or ‘Category C’. Some examples include dried blood spots; specimens from humans or animals that do not contain any infectious microorganisms or diseases (e.g. skin, blood, body parts); soil, water and plant samples not reasonably expected to contain infectious material. The diagnostic material must have primary and secondary containment (e.g. microfuge tubes within a sturdy ziplock bag). If the material must be kept cool for inter-campus transport, and where public transport is considered, then frozen ice blocks or gel packs may be used. You must NOT carry dry ice or liquid nitrogen on public transport as they are considered dangerous goods. It is not recommended to use wet ice as it melts and may leak. Quarantine material must also meet the requirements in Section 9. Infectious material, whether GM or not, should only be transported between campuses using an approved courier or by an authorised person using a University vehicle, and must be packaged according to Category A or B requirements as outlined in Section 6. GM material that falls into risk group 3 or 4 infectious microorganisms must be transported according to the conditions set out in the licence (DNIR) issued by the OGTR. All biological material may be transported in person within a campus or site (i.e. between buildings) provided it has been packaged and labelled according to the relevant section/s above and is accompanied by an authorised person at all times. If dry ice, liquid nitrogen or any other coolant that will release a gas is used in transport, then ventilation of the package is required. 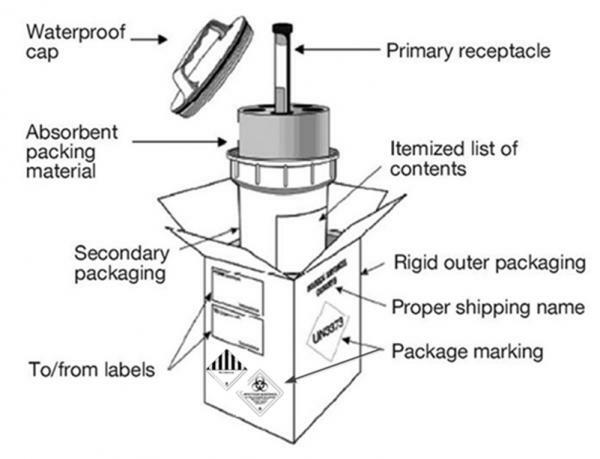 The outer package must be marked “CARBON DIOXIDE, SOLID” or “DRY ICE” or “LIQUID NITROGEN” and the coolant material should be packed outside the secondary container. A dry shipper should be used where possible when transporting material in liquid nitrogen. When transporting by vehicle and where liquid nitrogen dewars or dry ice is being transported then an open-air utility vehicle (ute), rather than a van or a car with a boot, must be used and the container must be restrained. Ensure ventilation of package so gas can escape. Where water ice or frozen packs are used as coolants, these must be placed outside of the primary package, and the outer package sealed so as to prevent the escape of melted ice. When transporting between campuses or sites, frozen ice packs are preferred. remove irrelevant markings before re-use. This comprises biological material that is not considered to be Category A or B infectious material, nor Genetically Modified, nor subject to quarantine import restrictions. These are non-dangerous goods and are not to be confused with transporting under ‘exempt’ specimens (as described in the Dangerous Goods Regulations). This may include plant material such as living plants, seeds, cuttings; or human or animal parts, or whole animals. Whilst this material may not be under an import permit directive, you should check with Australia Post on Plant quarantine regulations (Section D5.1, Dangerous & Prohibited Goods and Packaging Post Guide). In all cases of biological transport, a risk assessment should be conducted to determine the likelihood of spills, loss or theft. If the package is packed according to the correct packing instruction the risk event of spills should be minimal. Recording, tracking and accounting procedures should be in place so as to minimise loss of goods. Where an adverse event has happened, you must try to do all that is reasonably possible to obtain the material or render it non-viable. If necessary, spill instruction and a decontamination agent may need to be included in transport depending on your risk assessment, however take into consideration any further risk that any decontamination agent may add (e.g. bleach is considered a dangerous good). In any event of spill, loss or theft, report this to the Biosafety Advisor as soon as possible along with any actions you have taken to recover the material. The Biosafety Advisor will notify the relevant Regulator as required.